Always make the crate a happy place! Your dog should be able to stand up, turn around and lie down in its crate, it doesn’t need to be any bigger. The crate should always be associated with something pleasant and the training should move at a pace that your dog feels comfortable with. When your dog decides to go near the crate, reward them by throwing a food treat near the entrance/inside. Repeat this every time your dog chooses to go near it. If your dog decides to investigate inside the crate, reward this again with food treats. If your dog decides to settle down inside the crate then make sure to reward them heavily. It is important that you don’t shut the door of the crate yet. At this stage your dog needs to be able to come and go when it wants to. You can then start giving your dog their regular meals in the crate. Place the food inside and encourage your dog to eat. If your dog begins to enter the crate at meal time by itself then place the food inside as their reward. Once your dog becomes comfortable eating meals in the crate, you can begin closing the door. Start closing the door as your dog is eating, making sure that you open it again before your dog finishes eating. Gradually start leaving the door closed for short amounts of time once your dog has finished eating. If your dog whines, ignore the behaviour, then reward and open the door once your dog is quiet. 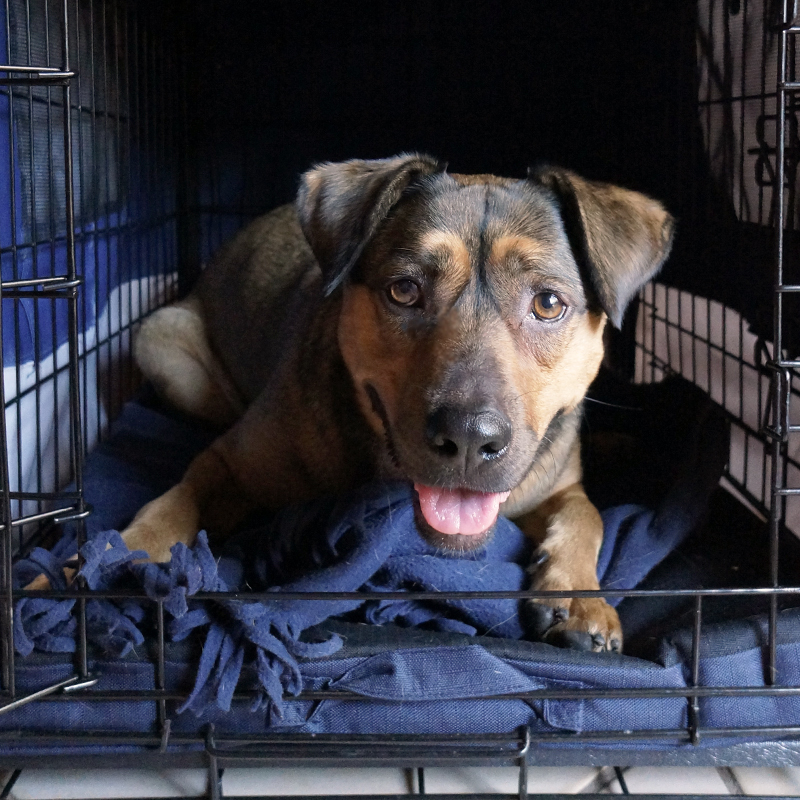 Once your dog is happy in the crate for about 10 – 15 minutes after finishing its meal, you can start to confine it to the crate for longer periods. Start bringing in a command such as “crate” as your dog is entering, then give it a treat, praise it and close the door. Sit nearby for a few minutes and reward your dog as they remain calm and happy. Continue with your daily activities, returning regularly to reward your dog for its calm behaviour. A little trick you can use to make your dog interested in the crate is to randomly place a trail of treats leading up to the crate as well as inside it for your dog to discover. It is a good idea to vary the length of time that your dog will spend in the crate. Doing this will prevent your dog from ‘expecting’ when they will be let out and reduce issues such as whining or scratching at the crate door. Always remember that if need any assistance when undertaking the training that you contact a qualified dog trainer.